Getting through these pictures is almost more exhausting than…being there? Than…getting to work Friday morning through the Cubs Victory Parade Crowd? Or picking up my annual birdseed order from Chicago Audubon yesterday? 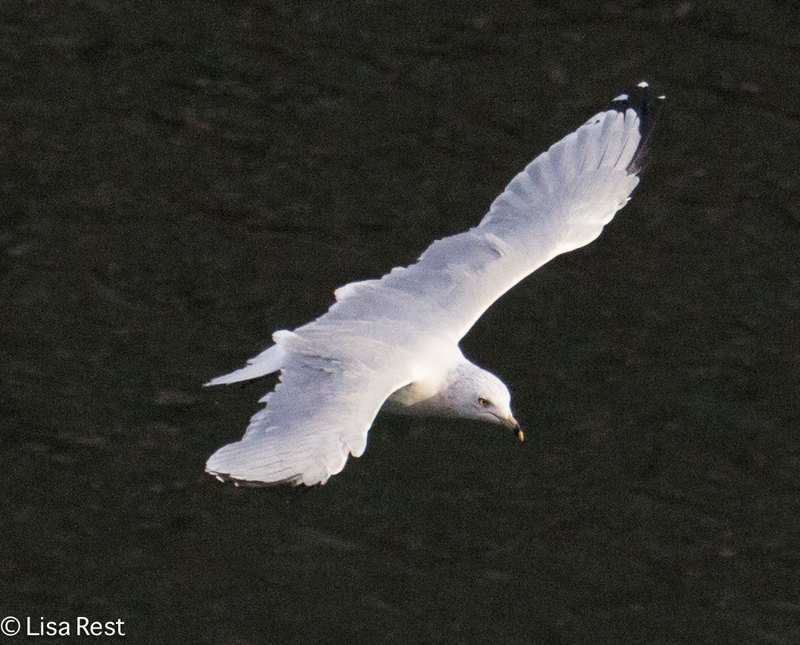 Below you are looking at potentially the most exciting bird we saw on the entire trip. Why? It wasn’t on our list because it’s endangered, so we were lucky enough to be allowed to look for it. Somehow our group got permission to visit the normally off-limits part of Southern Isabela Island, known as Playa Tortuga Negra, where the Mangrove Finch still exists in declining numbers. Also on this side of the island, a lovely Galapagos Flycatcher, interesting plants, and the ubiquitous Galapagos Mockingbird. We went back to the catamaran for an early lunch, then went snorkeling before exploring the lava rocks on the other side of the island. I tried out my underwater camera gear for the first time. I was not able to capture anything very well, but the dive was great fun. We never stayed in for very long, but I always felt like I could stay down forever. The lava rock on the other side of Isabela, from the landing known as Punta Moreno, was a challenge to negotiate. I’m likely not keeping all the photographs in order, but the presence of rock has a way of keeping things together. 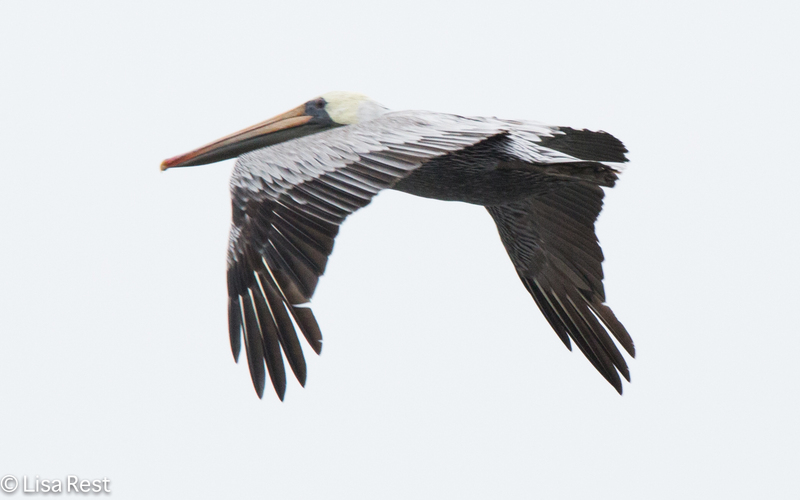 Below, Brown Pelicans on the left and a Blue-Footed Booby on the right. We had our Galapagos Yellow Warbler for the day (below left) and a Small Ground Finch. 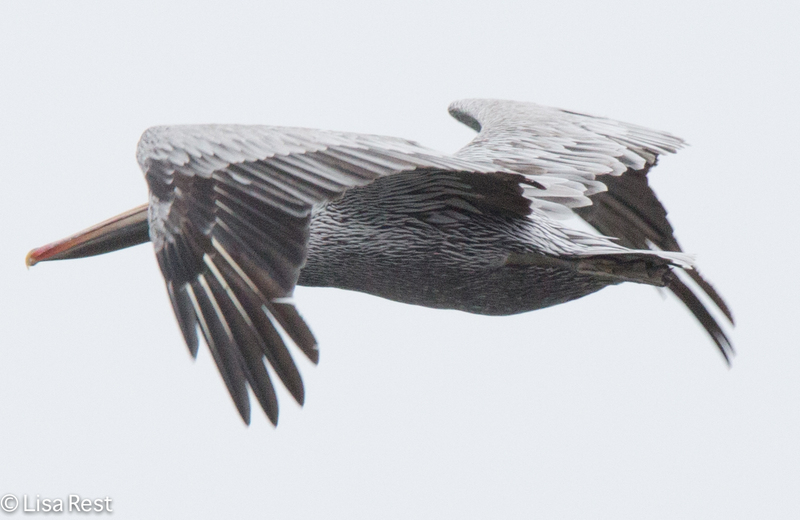 Below, a Striated Heron with a Sally Lightfoot Crab. 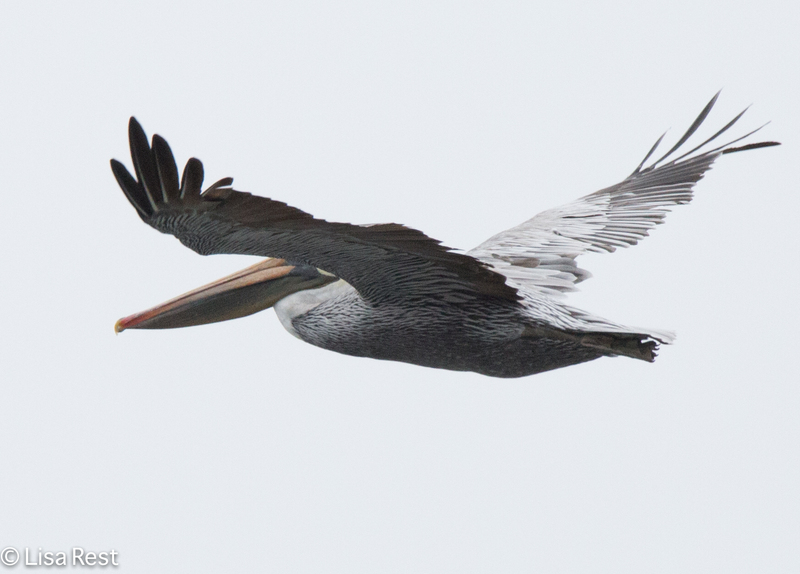 There were nesting Brown Pelicans (below), on the Playa Tortuga Negra side. A closer look at the Sally Lightfoot Crab and a Lava Lizard on the right. You’ll have to click on the pictures to see them better. Two types of cactus grow in the lava rock, Lava Cactus and Candelabra Cactus. Whichever one is getting started on the left seems to prove the point. 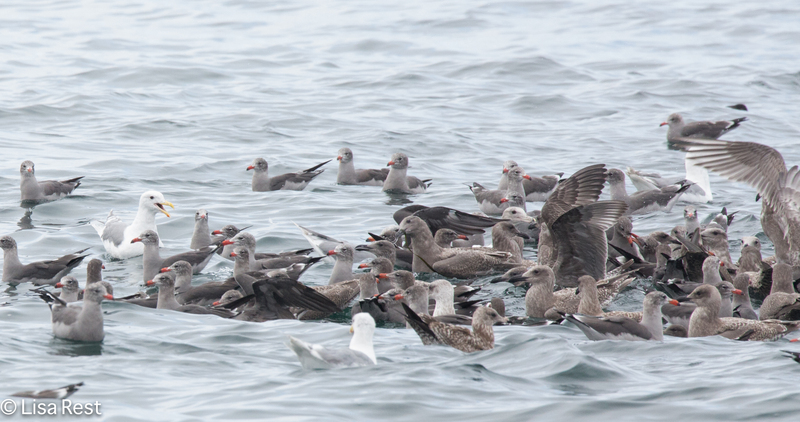 Below, some more species endemic to the islands: the Lava Heron and Galapagos Shearwater. 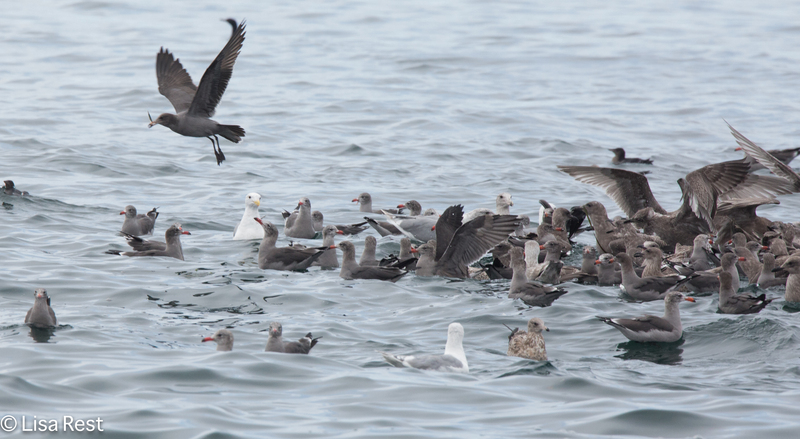 The Brown Noddy on the left is not an endemic species, but the Flightless Cormorant is. Check out its very blue eye. Where we saw the Flightless Cormorants nesting it was hard to get detail because of the intense light. So I’m glad I got to see the blue eye on the one above. Below, the Galapagos Penguin. 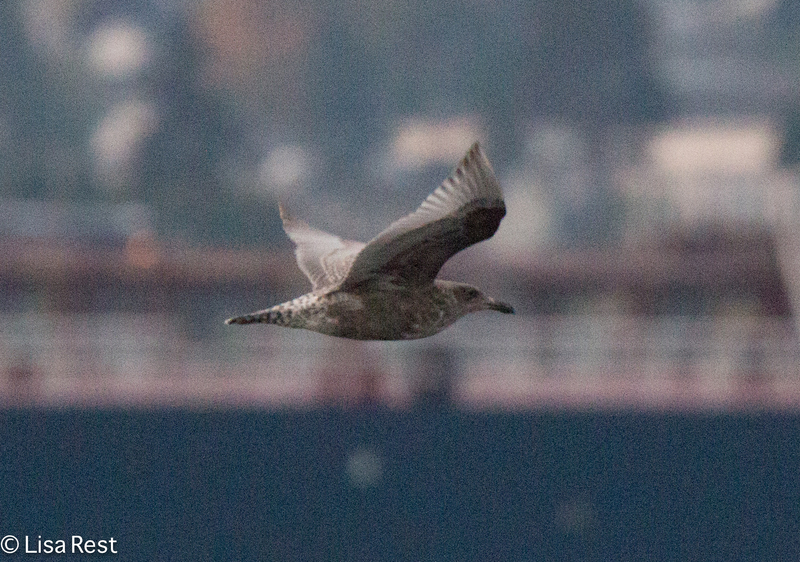 This was our best chance to see this delightful bird. Another Galapagos species…the White-Cheeked Pintail. We saw them wherever there was fresh water. 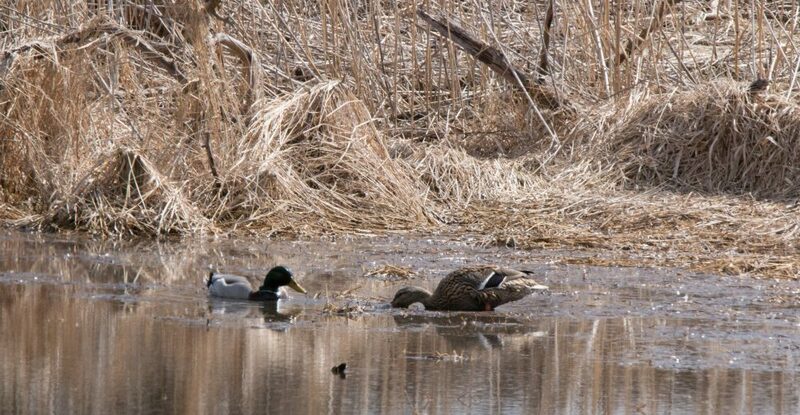 This is the only duck species on the islands. Again, we were pampered daily by the crew…the dinner sculpture on the left, and a sculpture of fresh towels in our cabin on the right. Here, back home in Chicago, it is November and we are having warm, sunny weather in the 70’s. The irony leading up to the worst presidential election of my lifetime is not lost. I’m borrowing that sentiment from a sermon heard while singing in the choir this morning. Not the irony part, but life seems overloaded with irony lately. I find I’m reminding myself to appreciate the moment as if there’s a more acute sense that I should not be taking anything for granted. I’ve been gone from this page far too long. Life has gotten in the way. It’s also been a time of reflection whenever I’ve had a chance to reflect without falling asleep. 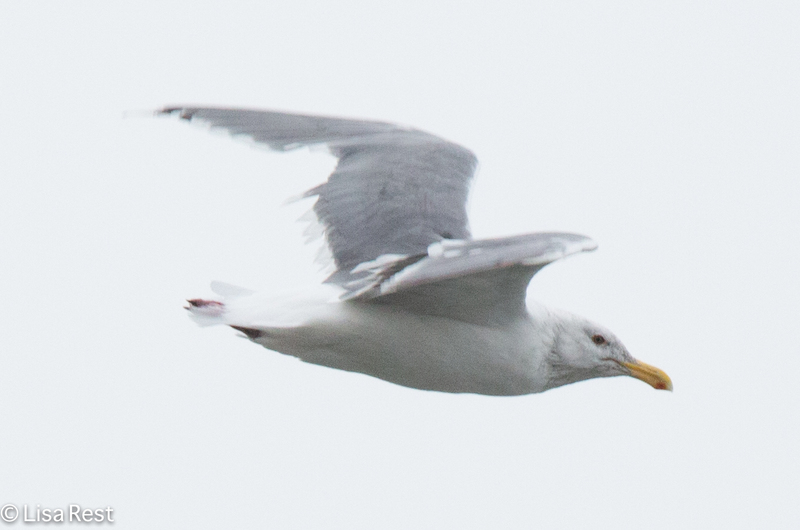 Over a week ago when I went back to the pictures from the ABA Olympic Peninsula trip, I was determined to make sense out of the gull pictures, at least, even if I still didn’t have the official lists of what we saw. A couple days ago copious emails hit my inbox with invitations to accept ebird lists from the ABA, and I haven’t had time to review them after accepting them all. While I was away, my Zebra Finches managed to reproduce and I have two more. 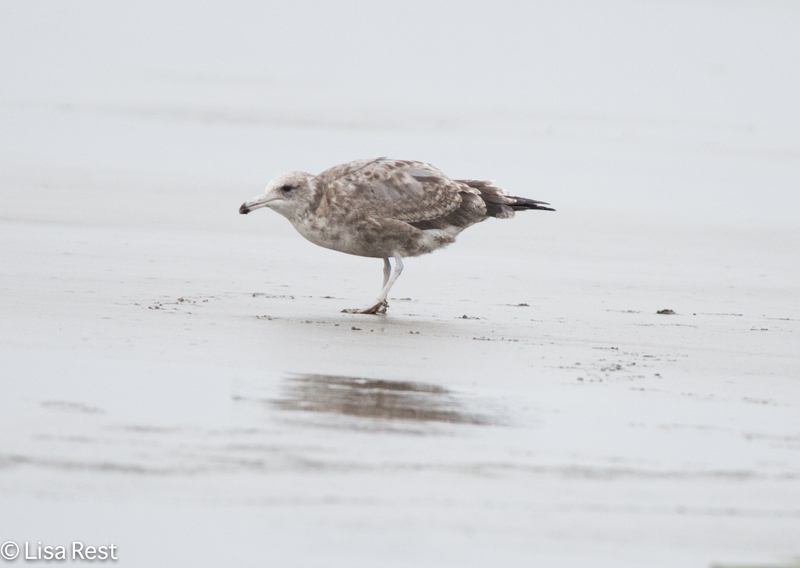 The juveniles were finally weaned last week and they are just starting to show color in their beaks. A week ago Tuesday night I had a hunch, called up PetSmart and went out to find Dudlee Ann a male Diamond Dove, whose name is Drew. I also picked up a budgie that appears to be a female, for Jeremy Casanova Green, to distract him from chasing the Zebra Finches. The experiment seems to be working out. I hope to have an update on the indoor crowd in the coming weeks. 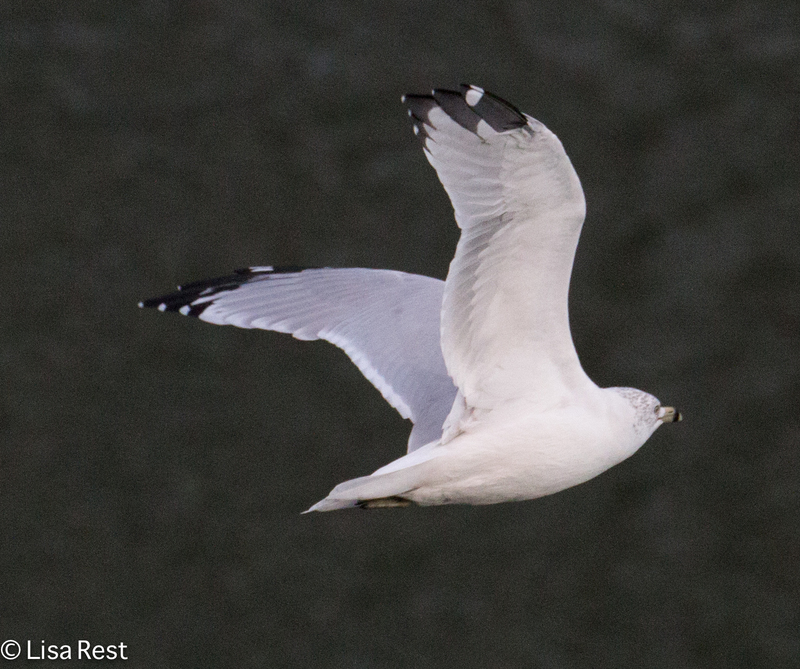 Perhaps my favorite gull pictures were those taken from the boat when we came upon large mixed flocks of them feeding in the water. 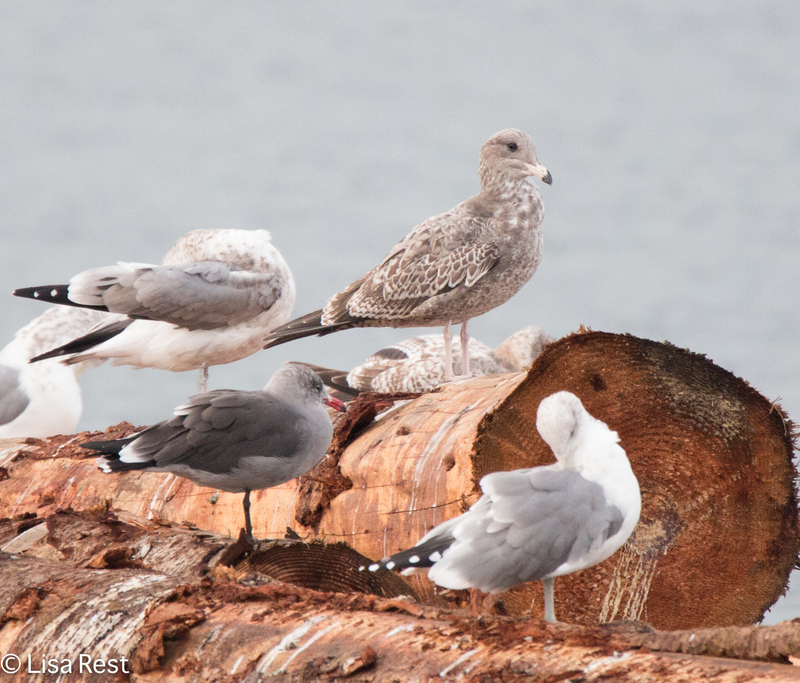 If you click on the picture to enlarge it, you will get the feeling that you are right in the middle of this gull gregariousness. 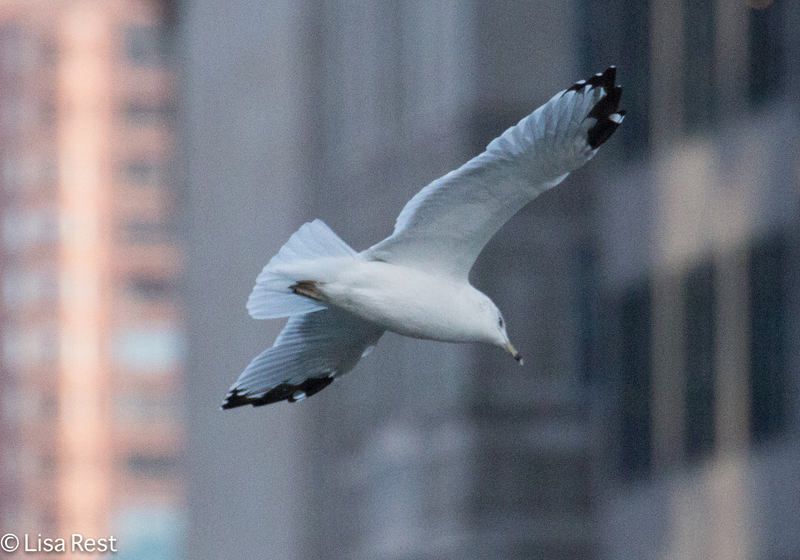 Barely two days before I left for the Pacific coast, I was watching this Ring-Billed Gull fly over the Chicago River on my way to work. 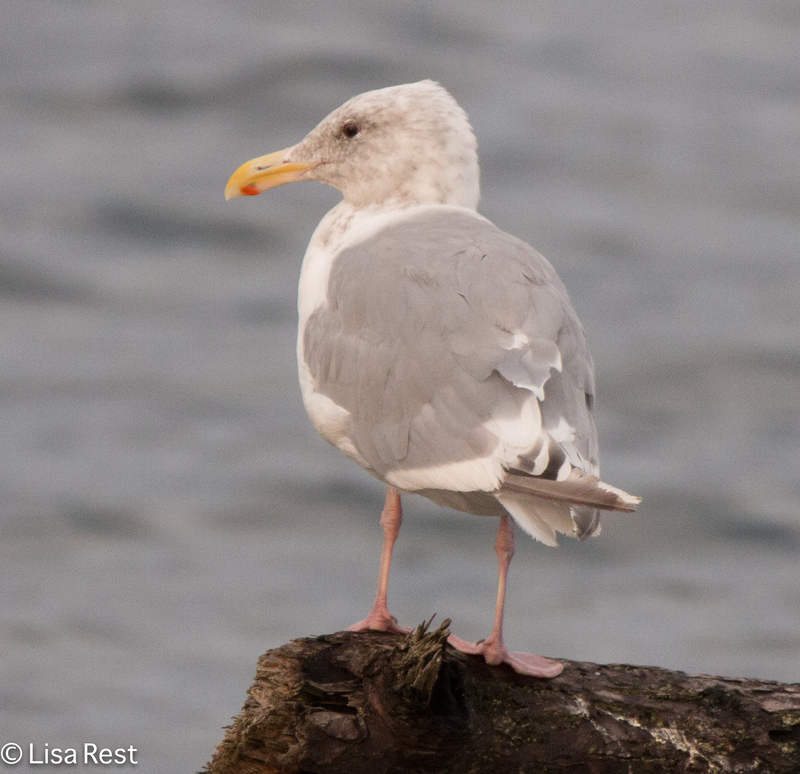 The gulls of the Olympic Peninsula were generally much larger than Ring-Billed. 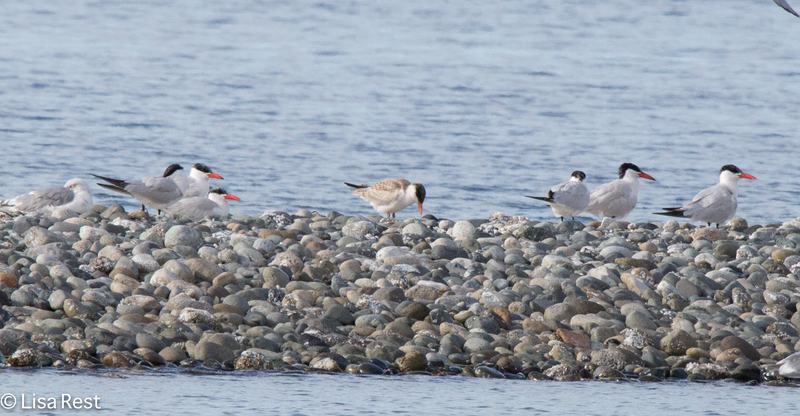 We saw large groups of Caspian Terns as well. 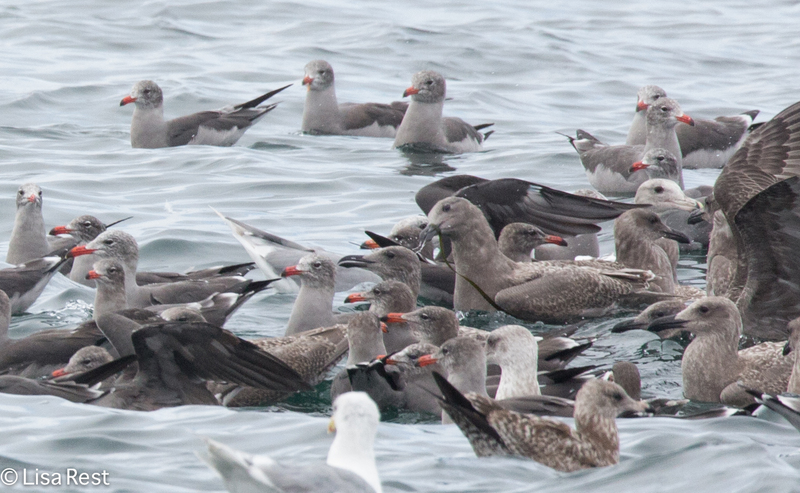 In general it was gratifying to see large numbers of any species. 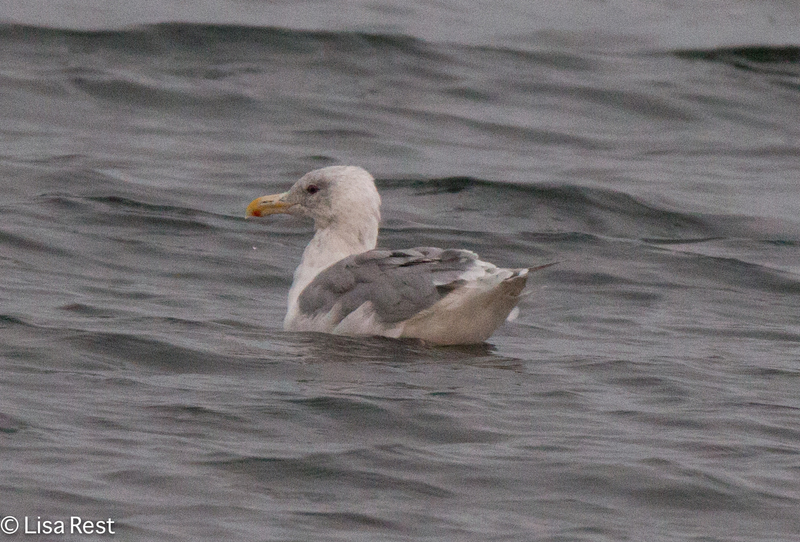 I am proud of myself, I managed to figure out the hybrid gull below before the official list confirmed my ID. Maybe I have been overreacting to the shorter days, the cooler weather, or the quadruple dose flu shot…or maybe I’m just trying to fit in more than I have energy for. I keep waffling about the choir commitment even though I have missed only one rehearsal when I was away, and have sung in three choir Sundays. I keep waffling about whether I want to continue. It’s been a challenge to find time for the blog and playing my renewed guitars. 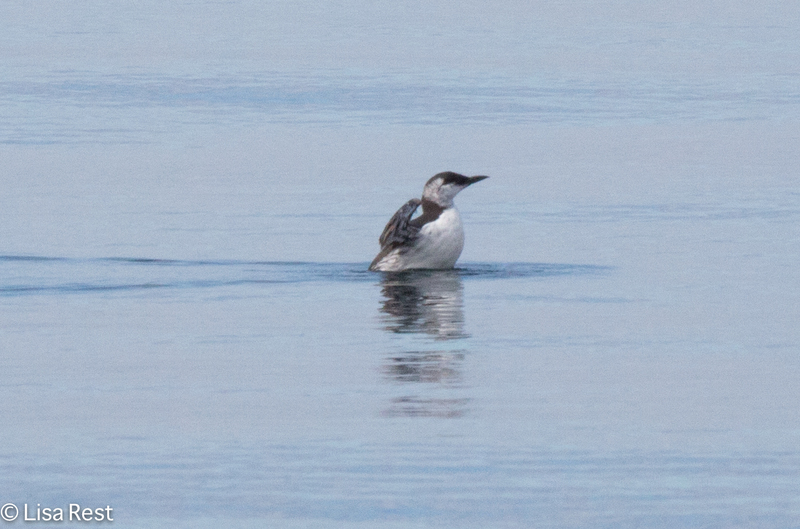 Marbled Murrelet is a new bird for me. 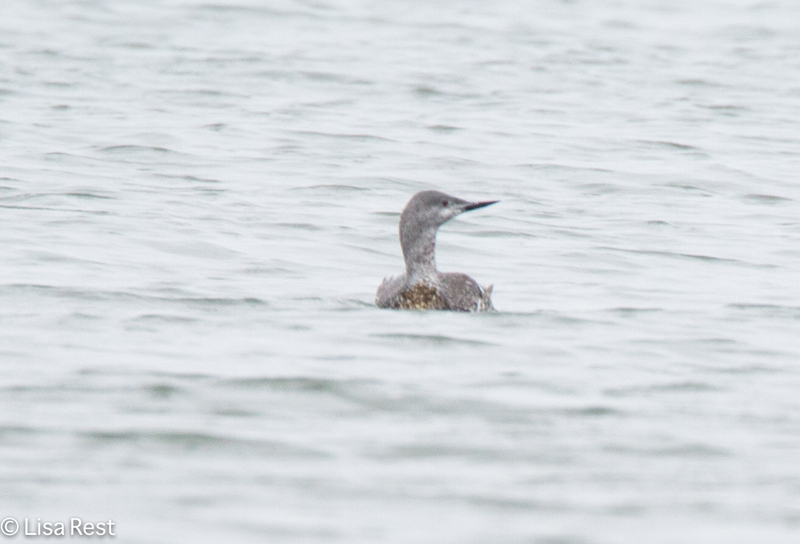 This Red-Throated Loon was distant but if you click on the picture maybe you can see just a little red on its throat. 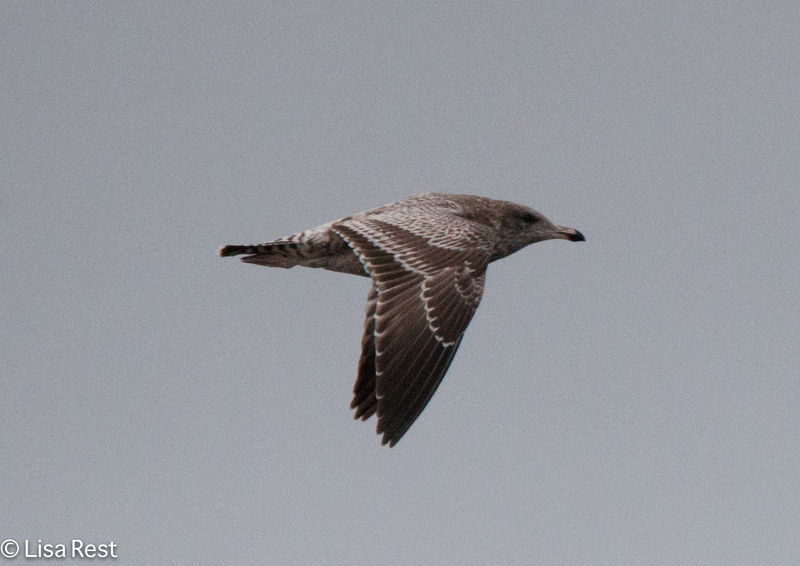 Our last day we saw many shorebirds but they were generally quite far away. I was glad to be able to get on this flock of Western Sandpipers. I have not been birding a lot but I have been lucky the last two weeks taking pictures here and there of more migrants. Migration is not over yet! 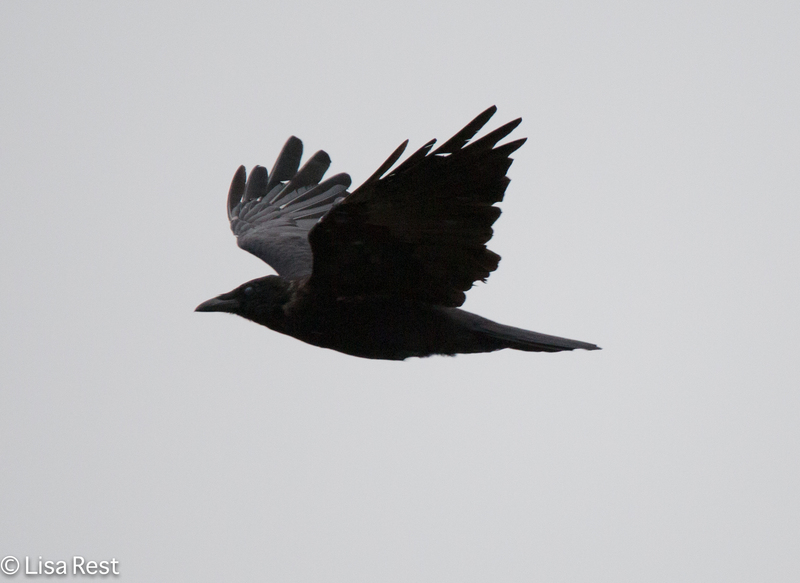 I will try to be back much sooner with birds I’ve seen locally.